The Tour tipi is a round tent with vent to make a fire. It’s inhabited like the real tipi by the primitive people of North America. The cover insists of impregnated cotton fabric. The only lifting pole allows an easy and fast installation, also for laymen. There is no complex guying. Pegs assure the stability of the tipi if there is a strong wind. The entrance of the tent is closed with a door flap. 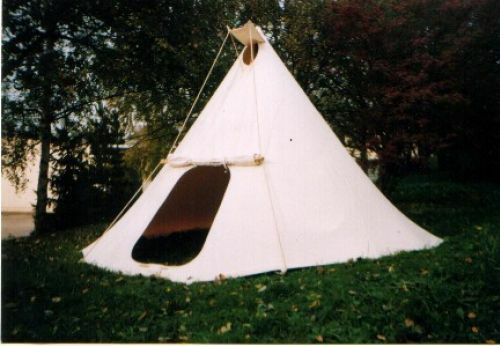 The door flap is formed like the door flap of the normal tipi and can be used as canopy. 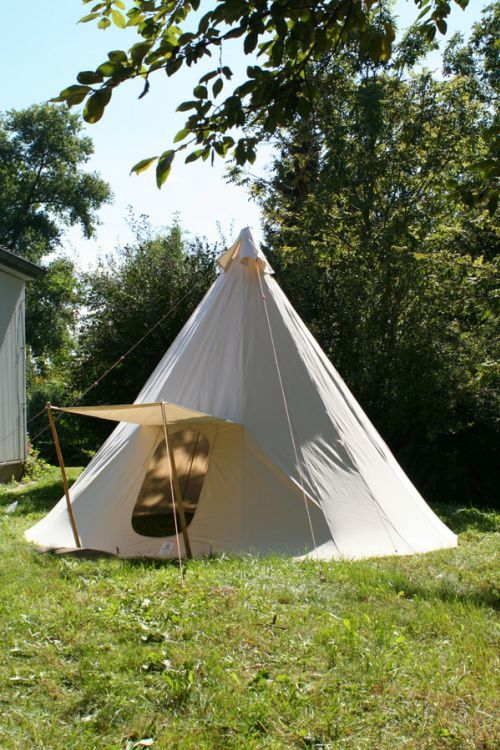 The natural tent is easy to transport and to install for mobile persons. The standard size of the tent is 3,50 m/ 11.48ft in diameter, the panel thickness is ca. 2,80 m/ 9.2ft. Use this tent type if you want to implement a stove. Our 2nd type is made from several wedges/ trapeziums and has a hole at the top. It can be closed with a cap if required. 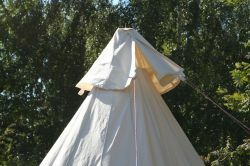 This tent type is usable to light a naked flame.